SpongeBob’s legacy extends beyond being a funny children’s show. Anyone who watched more than a few episodes became familiar with the off-kilter way of life in Bikini Bottom: the villainous Plankton is married to a computer named Karen, Krusty Krab owner and stingy boss Mr. Krabs somehow has a whale for a daughter, snails are the cats of the underwater world. You have to accept the strange logic of the universe Hillenburg created to enjoy each 11-minute episode. If you watched enough “SpongeBob,” you probably thought of him laying on the ground, acting out “photosynthesis,” in biology class. You read the word “karate” in your head the way Sandy pronounced it: ka-rah-tay. Maybe you ate those gummy Krabby patties that tasted like plastic, but you’d never admit that to your parents because it was also fun. The show created a unique language that could connect people of all ages who watched. Certain phrases from “SpongeBob” are nearly universally recognizable around people in a certain age range. “Is mayonnaise an instrument?” and “I’m ugly and I’m proud” are two among hundreds of others. The combination of fry cook and underwater references made a weird kind of vernacular. Sometimes sayings from the show are so common or worked so well that kids don’t recognize them as SpongeBob originals. Once a few years ago, I was babysitting a six-year-old boy when he dropped his plate of chicken nuggets. Although he was very specifically not allowed to watch SpongeBob — his mom reminded me of this before she left — he yelled “Oh tartar sauce!” as he dropped it. I expected him to try to excuse this somehow, but he didn’t even realize he’d outed himself as a secret “SpongeBob”-watcher. I had a few other friends throughout elementary school who weren’t allowed to watch “SpongeBob”; their parents thought it was stupid and a waste of time. This felt strange to me then, because I was usually allowed to watch whatever I wanted, but today I think this designation of SpongeBob as a mindless show is wrong. It’s definitely silly, but it also offers something for just about every situation. I still think about SpongeBob fearfully biting through his hands like popcorn when I find myself anxiously biting my own nails. Sure, you have SpongeBob’s usual shrill happiness, Squidward’s grumpy attitude and Patrick as the bumbling idiot, but the show does portray other emotions. When Sandy misses Texas, or SpongeBob loses Gary, this deeply silly show can make us feel. 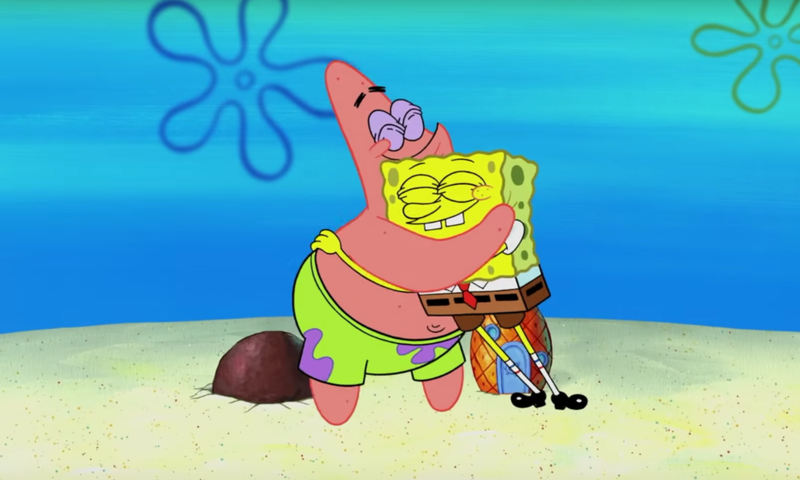 While I love the iconic quotes and recognizable characters, the real center of SpongeBob is its commitment to absurdity. It’s weird for the sake of being weird and silly for the sake of being silly. When Sandy and SpongeBob debate which is better, land or sea creatures, they end up on land as live-action puppets. This strange moment, out of the show’s animated style, isn’t really necessary and doesn’t make much sense, but it also doesn’t have to. Watching “SpongeBob” is so fun because there’s the sense that anything can happen. A magical pencil can fall to Bikini Bottom and draw a mutant SpongeBob doppelganger into life — I used to be deeply afraid of DoodleBob. Characters have a campfire underwater while creating nonsensical rules that prevent “sea bear” attacks. Even the show’s intro and theme song work with the same lack of rules: the pirate who asks “Are you ready kids?” sometimes randomly appears in episodes, along with a French-accented narrator. Who are they? Why are they singing about SpongeBob? Frankly, it doesn’t matter, and that’s exactly why the show is so great.